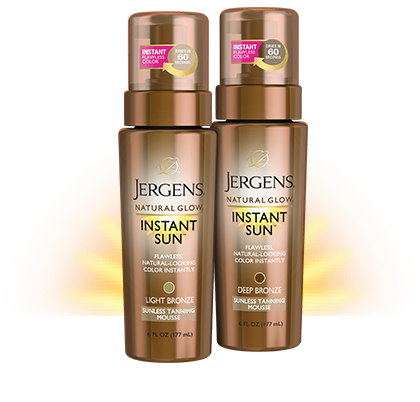 JERGENS® Natural Glow® Instant Sun™ Sunless Tanning Mousse uniquely works with your skin tone to mimic results from the natural sun. This airy, moisturizing mousse allows for a precise, even application that dries in just 60 seconds. Use pump to dispense airy mousse into hand and smooth on to skin. The tinted mousse shows you exactly where your colour will develop to provide a streak-free, sunless tan.